a large commemorative stamp of the “Historic Places Of Italy” series was dedicated to the Grand. After reading all these interesting stories, I really looked forward to visiting this grand old lady. The sun was rising over the crystal clear waters of Lake Garda, I sat for a long time absorbing the stunning scene until the aroma of fresh coffee began to rise from the restaurant terrace below. An absolutely amazing Italian buffet breakfast was a welcoming sight as we entered the dining room, delicious fresh fruit, bread, prosciutto, salami, a selection of local cheeses and of course great Italian fresh coffee. I had already decided I would not be counting calories this week! 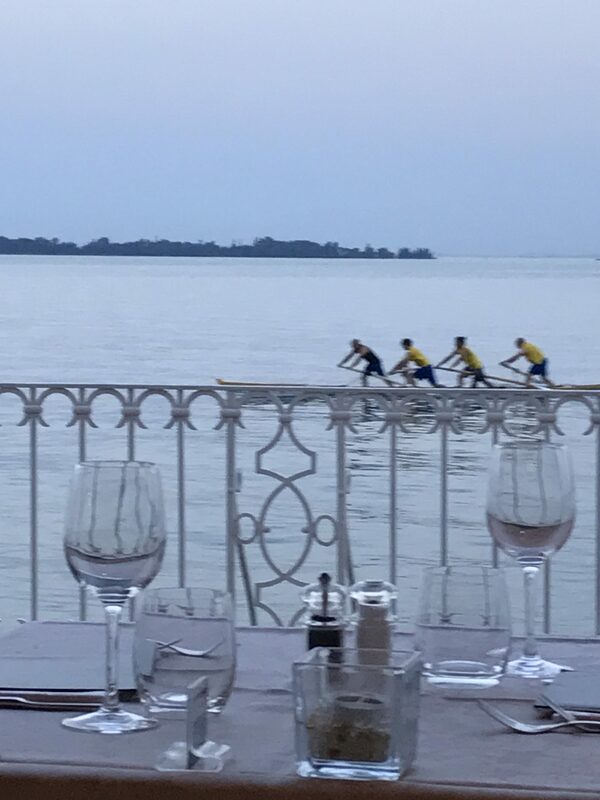 The setting was amazing, restaurant by the waters edge, sun shining and the beautiful mountains in the distance, these are days you dream about. We had arrived the evening before in the middle of a spectacular lightening storm, the rain was dancing off the ground! The torrential rain didn’t appear to dampen mood or humour of the people returning from a regatta, only ours, as by the time we made it to the hotel entrance from the coach we were soaked to the bone. After checking in and shown to our rooms by a friendly and witty porter a quick shower it was back down and to the bar for a G&T and a bite to eat. This majestic old building has been Gardone’s leading hotel since the 19th century when tourism first came to the area. Its lofty ceilings and large rooms reflect an atmosphere of a bygone era. Now a listed building it is still as grand in every sense of the word. 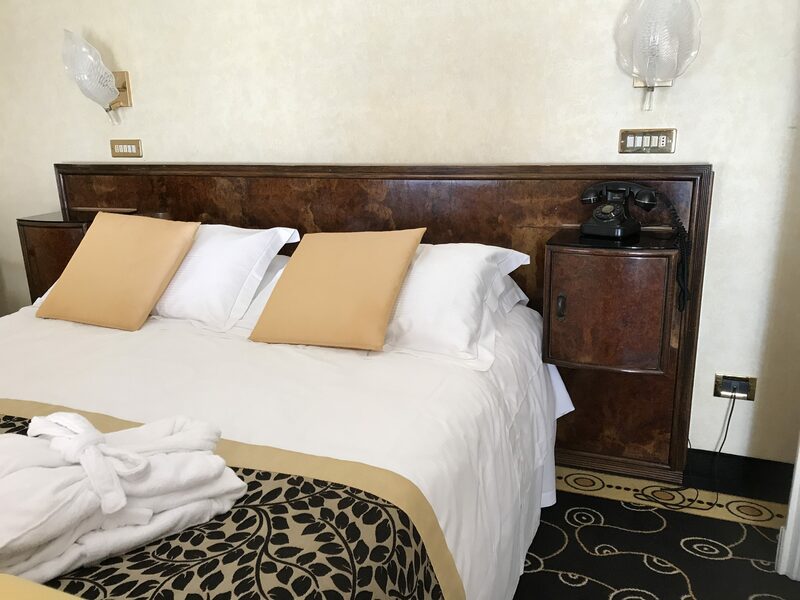 While maintaining all the elegance and charm of the original hotel it features all the modern day comforts and facilities we have come to expect and depend on. á la carte terrace restaurant and outdoor heated swimming pool. There are two restaurants, the main buffet offers an excellent three course meal each evening. Every meal begins with a salad, there is a choice of starter and desert from the buffet with main course ordered from the menu. 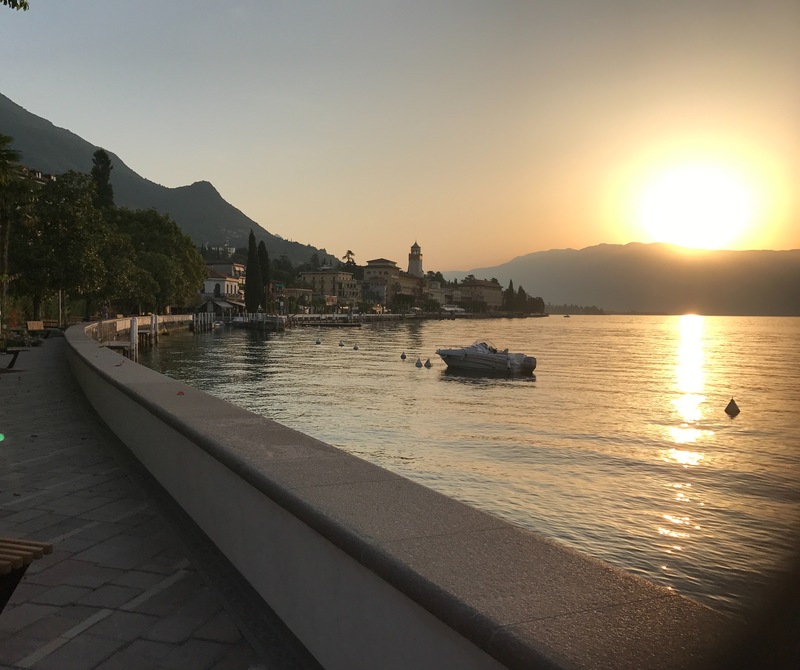 For that extra special fine dining experience you must try the 11 “Gardino dei Limone”, the atmosphere is wonderful and food sensational, wine from the Lake Garda regions was up there with best you will taste anywhere, of course we had to sample a few varieties! One of the main reasons the food is so good is that the chefs use produce from the regions around the lake. 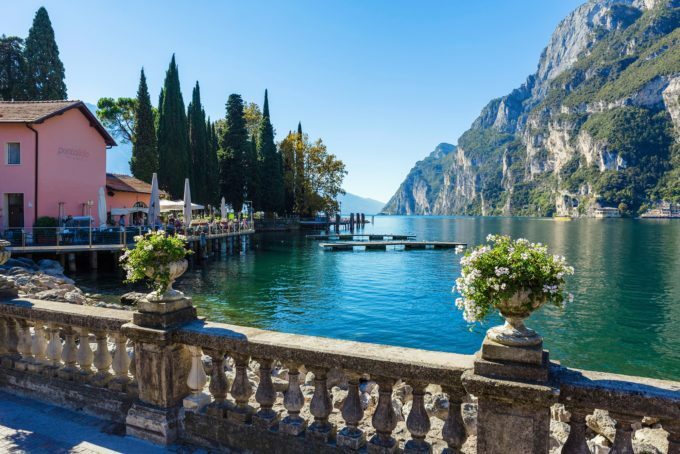 Lake Garda’s own microclimate extents from the Alps in the North to the hills in the south, Mediterranean vegetation combined with alpine. 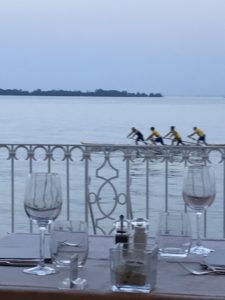 All along the lake’s coast you will find typical Mediterranean vegetation, there are lemons trees in abundance, olives trees which produce the finest oil, grapes that make the best Italian wines, rosemary bushes and beautiful palm trees. The Grand Gardone has a fascinating history, famous people such as Somerset Maugham, Russian American writer Vladimir Nabokov, nobel laureate Paul Heyse and Winston Churchill have been a few of the Grand’s distinguished guests through the years. The hotel was converted into a hospital during the war and Mussolini who was also a regular guest visited the wounded including his son Romano who had been hospitalised after surgery. We were fortunate to see the Churchill suite, this was indeed an experience. Everything was as it had once been, the furniture, fittings, telephone, the old fashioned bed. It was as though he had just stepped out for a moment and we had stepped back in time. 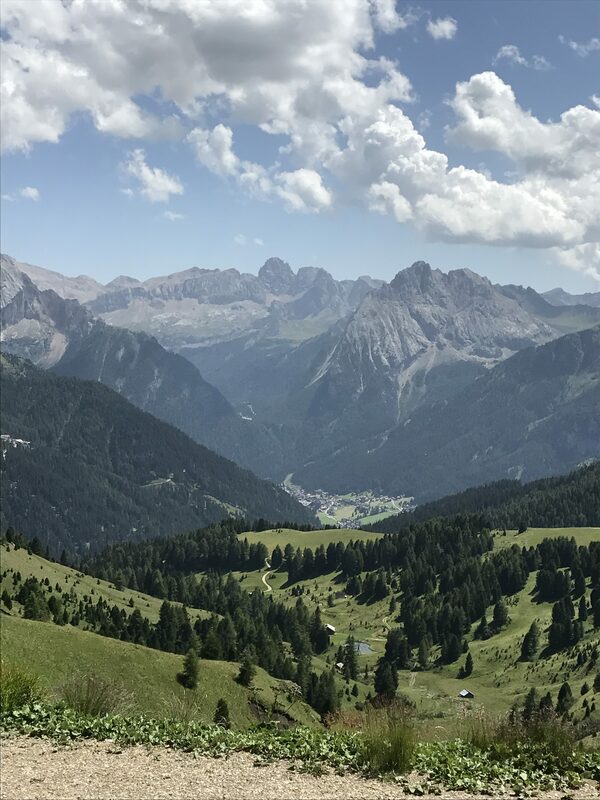 In years past visitors came to area because of the mild climate and to the Grand, Gardone because of the wonderful food, luxurious accommodation and fabulous location. Not much has changed since then, guests still come to Lake Garda for the same reasons. Whether you come to enjoy the sun, relax, or to indulge in the Grand’s wellness facilities, everything is here for you together with staff who will attend to your every whim! 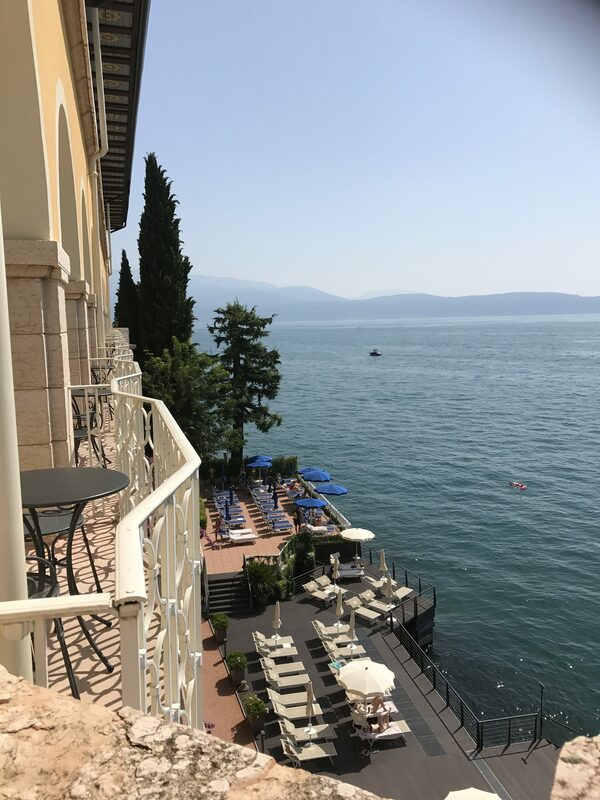 The fabulous out- door heated pool is surrounded by luxurious sun loungers and parasols and if you prefer to swim in the lake there are steps from the sun terrace. 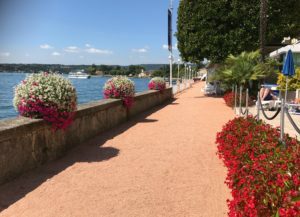 The hotel’s private promenade leads out on to the Gardone piazza, from here you can stroll along the lake shore, stop for a coffee or a glass of wine! We stopped a great little place called Comida Casera, just a short walk from the piazza. The owners were very friendly, we ordered a glass of wine and out came a little plate of bread and salami, it was just a lovely lazy way to spend an afternoon. Gardone has many famous tourist attractions one of which is the home of the Poet Gabriele D’Annunzio, a renowned eccentric which he named after an Italian military victory, Il Vittoriale degli Italiani. This house is totally bizarre, reflecting the very essence of the poet. The Liberty styled villa was presented to the poet by the Italian State. He spent most his time creating fantasy additions to the house and gardens. As well as an amphitheatre, and a mausoleum housing the poet’s remains, it has a warship in the garden and rooms filled with unlikely objects including weaponry and a coffin-shaped bed. Well worth a visit! Another place of interest is Heller Botanical Gardens which took over 60 years to create. There are many exotic plants and amazing sculptures. Another popular attraction and close to the Grand is Gardone Sopra, [Garden Above] an old village with colourful houses and lovely, little restaurants. 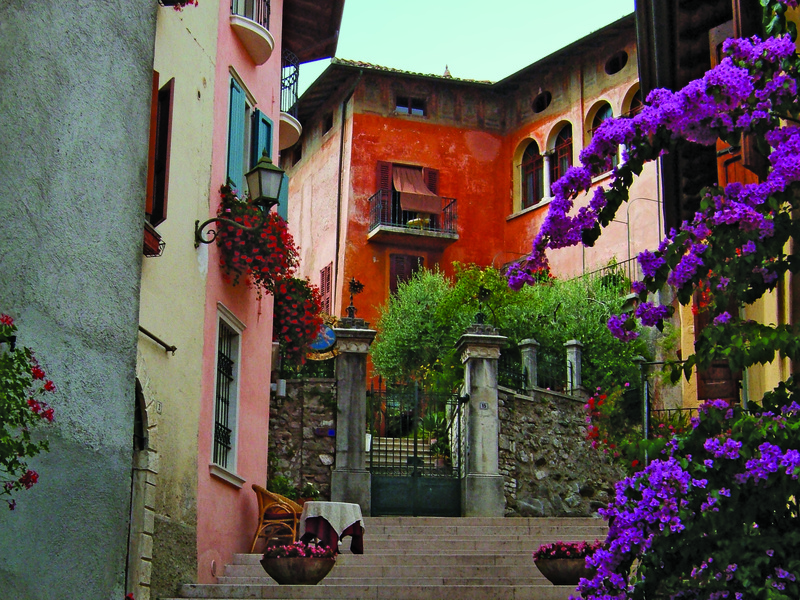 The picturesque towns and villages around Lake Garda are easily accessed by ferry and road. There is a private gate at the end of the hotel promenade which is just beside the ferry terminal. I loved the ferry, hop on hop off when you feel like it. Some of the places we stopped off were Sirmione, Limone, Riva, and the shopping capital Salo. extremely well organised. The luxury coach arrived at the hotel on time, we stopped at some lovely villages along the lake shore picking up passengers before heading up into the mountains. The journey up the narrow roads and round hair-pin bends was pretty scary. At times I could barely look out the window, yet I didn’t want to miss any of the spectacular views. Once you arrive at the summit you have the option of taking the cable car up to the very top. I admit I did chicken out and I regret it, but I intend returning some day to complete the experience. There were plenty of very nice restaurants, all buzzing with hungry tourists. The restaurant terraces overlooked valleys and mountains for miles around. There were also some unique souvenir shops that sold alpine memorabilia. greatest cyclist. A magnificent memorial built in his honour now stands on the summit. Another day we visited the medieval city of Mantova, and then spent the afternoon in the peaceful gardens of the award winning Sigurta Park. 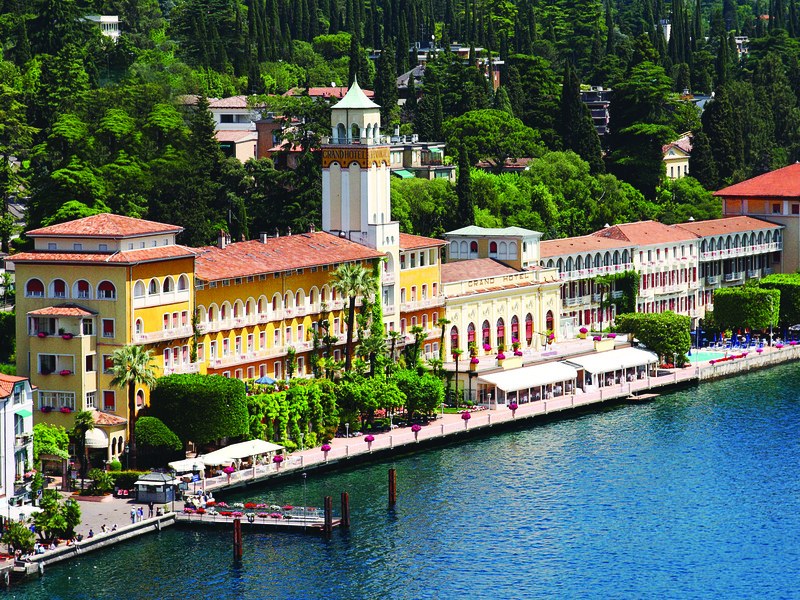 Tui also organise day trips from Lake Garda to Venice, Milan, Verona and Florence as well as day trips around the Lake. The fabulous Franciacorta golf course. Golfers coming to Gardone will be surprised at number of courses there are within driving distance. Hotel guests are offered between 15 and 20% discount off green fees. We played Franciacorta which is in the province of Brescia, on the morainic hills. The 18 hole Championship course is surrounded by beautiful woodland and vineyards. There is also an excellent little 9-hole course. Fees are approximately 60 euros midweek and 78 weekend. Cart hire 45 and 5 for trolley hire. This holiday with Tui was amazing, from the minute we arrived in Verona airport Tui staff took charge, the organisation was superb, no rushing for taxis or hire car, just a luxurious coach to transport tired travellers their hotels. Staying at The Grand Hotel was a fascinating and thoroughly memorable experience and one I would happily recommend, whether it be a holiday by the lake, gastronomy, golf or simply a relaxing spa break. Tui will be flying to Verona from Dublin on Wednesdays and Saturdays from the beginning of May to the end of September. 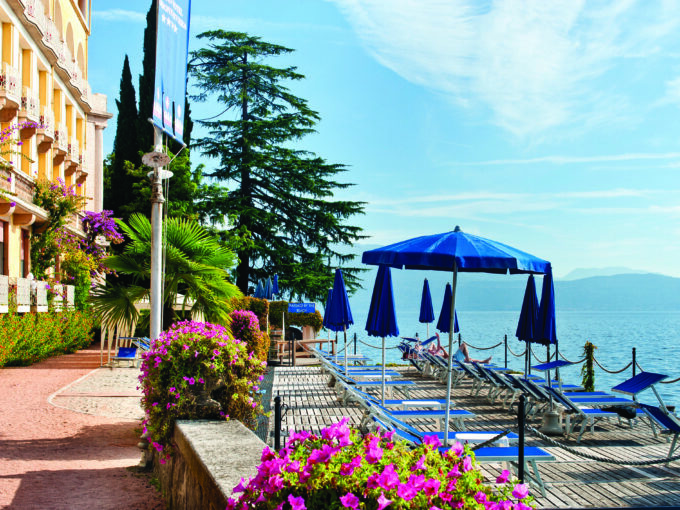 Prices for the 4 star Grand Hotel Gardone on June 9, for example for one week per person is €1269. Booking can be made through Tui offices or with any travel agent. TUI UK and Ireland is the UK’s largest tour operator with key brands including Thomson, First Choice, and Thomson Cruises as well as Crystal Ski Holidays and Thomson Lakes & Mountains. TUI UK and Ireland’s airline, Thomson Airways is the UK’s third largest airline with 63 aircraft operating to over 88 destinations in 30 countries. Thomson Airways was the first airline in the UK to take delivery of Boeing’s 787 Dreamliner. 20 km from Gardone using the ferry boat from Maderno to Torri.